I suppose the idea is to eliminate the crack at the top for the more difficult topout? Quite ok, although very short. With the beta from the video. A bit reachy. Surprisingly fun little climb. Had to clean it a little bit. The climbing is as good as on any of the other routes of the same grade, its just a bit short. Mun mielestä alkuun sai vähän nihkeästi varmistuksia pro1:seksi, mut toisaalta olihan siinä isoja hyllyjä. Eliminating the right wall seems a bit silly for this one. In the blazing heat. It's a very nice route indeed. 2nd go. Felt about equal hard as the 6A and 6A+ on the wall. Olipas hankala. Piti oikeen rutistaa. It's an ok little boulder. 6A+ is about right? Felt much harder than 6A. At least if you go straight up with the big sloper + hold of the arete. What a great top-out. Definitely worth climbing. A nice line. Didn't feel super difficult. An ok start into a great top out. Really nice and technical. A nice little boulder. Climb it without using your hands. Proper smearing! Technical start in to a easy finish. Nimetty toistonousijan haukkareiden mukaan. A very nice easy climb. Vihdoinkin se asento löytyi :) Mahtava reitti. A pretty good warm-up :) Kind of an easier version of tyrävyö. A nice boulder with just a few moves. The starting holds are kind of high up. Maybe 6A+ is more appropriate. Just a few tries. Nice compression moves. About equally hard as Ketunnokkatissi. A prober straightforward boulder with an enjoyable top. Quest for silly variations continues! One of the best 6C's in all of Turku area imo. A good boulder. Tried it maybe 7-10 times a few weeks ago and now did it on the first try of the day. Nice route. A bit on the softer side maybe? The start is a bit awkward, but the rest is ok. It's an ok route. Go up via the big sidepulls on the right wall. A brilliant little problem. It's really not the easiest 6a there is. From a sit start. Did with a straight forward power beta. Not as nice as Oksa imo. A nice problem with good movement and holds. It actually felt almost as hard as jumi ss a.
I always thought that this one was all about pulling on those desperate little crimps as hard as you can, but it ended up being a nice balancy adventure! Best problem on this wall in my opinion. First try today. Maybe not 7a. Nice, but maybe a bit easier than 6B. 2nd go. Started with the right hand on the arete. Seemed more logical to me. 2nd go. The crux crimp is a bit rough. A bit soft. Nice. Maybe a bit soft. A great traverse. I was super pumped at the end. Felt maybe abit harder than 6B. I climbed it straight up via only the crimp. It was nice and felt hard. First try after doing hypnoosi. 2nd go. Kind of easy. It took just a few tries. In my opinion it's just a tiny bit harder than iso poika. This one took me so far the most tries out of all the traverses in Luolavuori. The crux for me at least is hard. A proper pump fest. A good addition to the traverses in Luolavuori. Some of the holds are a bit rough. I've tried this once on top rope a bit over a year ago. Now 1 try on top-rope and then then did it on the first lead try :) Could be 6c imo. I've propably tried this some years ago so no flash. Anyways it's a nice route. The first move is powerful and kind of hard. A few tries. Holds are nice but when climbing it you feel kind of cramped. It's an ok route, but not 6B imo. Tried the dyno a few times and felt that the hold was a bit to sharp to hold comfortably. So I did the non-dyno version. For my height/reach that felt like 6C maybe. Good to climb alone :) Much harder than kauhavalainen. The last crux move is brilliant! This has been a long battle for me. Tried it last year and couldn't do it (and the year before and the year before that). It's basically just one hard move. Top-roped it (or at least tried to) a few years ago. So no on-sight. It's a great route btw. Pretty nice. A few of the classic luolavuori traverses still to go! After repeating the route I decided to agree with the 6C grade. Pretty nice. Not too easy imo. Very rough. I got very close to flashing this one. A bit soft. Maybe 6C+? Quite easy with the right heel hook. Brilliant. I really enjoyed this one. 6c+ is the correct grade. I agree with the guidebook grade of 6B. The guide book says 7A but it might be a bit easier. It's probably harder if your veery tall. Did this maybe 2-3 years ago. Right hand high on the sloper on the start. Another problem that I have overlooked many times. Pretty decent stuff with a nice "jäpitys" in the start. The rock and the moves on this route are really good. I have overlooked it so many times. Too bad it's a bit short. There is a few good moves in the start. Pretty nice and a bit high. It was kind of difficult to find the right beta for this one. A piece has come off(?) making the route a lot easier. A very cool route! Repeated it with the arete only for hands. That way it's maybe even better! Didn't really enjoy this one. The top felt horrible, but maybe my beta was just wrong. Cool but a bit sharp topout. You definetly shouldn't topout this one to the left because then you'll miss all the fun! Flashed the standstart and did the sit-start on my first try. 3rd try. Cool move to the left arete. High and mighty maaaan. Peace. I think it's clearly easier than 6b. It doesn't look that nice but the moves are pretty good. 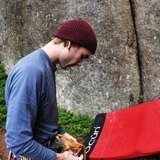 It's a pretty nice dyno although it's not the real Mister T. This one is around 6A+/6B imo. We used only the right side of the crack. So no jamming! Nice moves on super small footholds. Repeat with dyno beta. Didn't feel any harder than with using all the holds.